New data from the U.S. Energy Information Administration (EIA) reveals a troubling trend: Coal-fired power generation—and its associated greenhouse gas emissions—were on the rise as 2012 came to an end. According to the data, which was released yesterday, natural gas prices have risen significantly since April of 2012, prompting a rise in coal-fired electric generation (see figure below). This increase marks a dramatic change from the trends we’ve seen in the United States over the past several years. U.S. energy-related carbon dioxide (CO2) emissions from the power sector had been falling, mostly due to more electricity being generated by renewables, slowed economic growth, and a greater use of low-cost natural gas, which produces roughly half the CO2 emissions of coal during combustion. The new uptick in gas prices and coal use suggests that we cannot simply rely on current market forces to meet America’s emissions-reduction goals. In fact, EIA projects that CO2 emissions from the power sector will slowly rise over the long term. To keep emissions on a downward trajectory, the Administration must use its authority to prompt greater, immediate reductions by putting in place emissions standards for both new and existing power plants. What Happens if Market Forces Continue Changing? 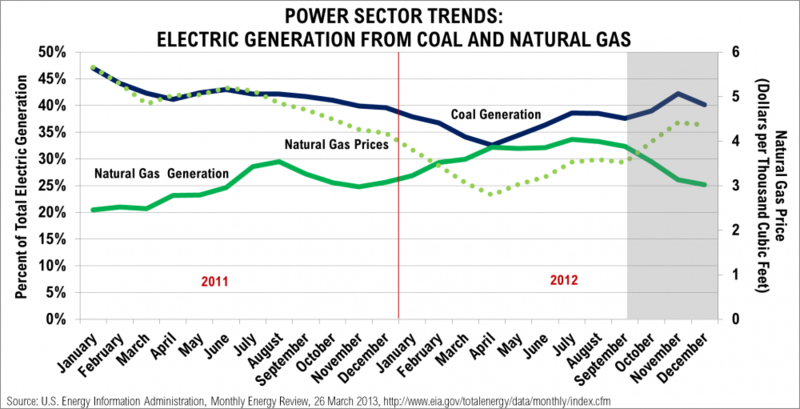 Over the past several years, low natural gas prices, along with increased gas extraction, have contributed to the power sector shifting away from coal-fired generation toward natural gas-fired generation. In fact, the U.S. produced less than 40 percent of its electricity using coal for most of 2012. The last time this occurred was for a very brief period of time in 1978. However, the most recent data from EIA shows that natural gas prices for the power sector have increased by more than 50 percent since April 2012. Over the long-term, EIA expects that natural gas prices for the power sector will increase by about 3.4 percent each year from 2012 through 2040. On top of these price increases, electricity demand is expected to grow by 28 percent by 2040. EIA projects an increase in both natural-gas fired generation (30 percent), as well as coal-fired generation (18 percent) between now and 2040 to meet this demand. Without additional regulations, these trends are poised to increase U.S. greenhouse gas emissions. The good news is that the Obama Administration has the tools to not only prevent an increase in CO2 emissions, but to put the country on track to achieve its goal of reducing emissions 17 percent below 2005 levels by 2020. Emissions standards for new power plants, like those proposed by the Environmental Protection Agency (EPA) last year, can help ensure that our climate’s future is not subject to the vagaries of fossil fuel markets, and that new coal plants will not be built unless they contain greenhouse gas emissions controls like carbon capture and storage. Standards for existing power plants—which the EPA has yet to propose—would offer an important complement to these standards. With power plants accounting for one-third of U.S. greenhouse gas emissions, they offer a high potential for curbing the effects of climate change. New standards would drive emission reductions from the existing fleet of power plants through measures such as onsite and consumer efficiency improvements, increasing renewable deployment, and by using low-emitting generators instead of dirtier units. For example, even with low natural gas prices, the existing fleet of combined cycle natural gas units is not operating close to full capacity. New standards could encourage using this currently unused capacity instead of coal, presenting a large opportunity to reduce emissions in the near-term by increasing generation from existing natural gas plants. We can’t simply assume that the markets will drive this switch. WRI’s research shows that standards for both existing and new power plants are essential if the United States is to achieve its 2020 emissions-reduction target. As we see with the new EIA data, the dynamics of the market are not sufficient to achieve this goal. Acting now on emissions standards for power plants will not only set the country up to achieve its short-term GHG goals, it will ensure that power generation becomes cleaner for future generations—even in the face of market variations. U.S. Natural Gas Exports: Friend or Foe?